The concepts of the “melting pot” and “cultural pluralism” were both responses to decades of massive immigration, both articulations of how such great differences could be shaped into a new American identity. Yet another voice in the public debate insisted that there were too many newcomers and too much difference to assimilate. This voice called for a more definitive response: to close America’s doors completely. America, in this view, could not bear the increasing burden of being forced to define itself anew along multi-ethnic and multi-religious lines. The doors of Ellis and Angel Islands were effectively slammed shut with the Johnson-Reed Act (1924), which established quotas for immigrants on the basis of national origin. It was the culmination of a decade of restrictive measures: “barred zones,” from which immigration was restricted, were established—including all of Asia; a literacy test was enacted; and in 1921 a quota system granted 82 percent of the entire immigration quota to Western Europe. The Johnson-Reed Act further restricted the immigration of a given nationality to only 2 percent of the number documented as living in the United States by the census of 1890. In the wake of World War I, a growing xenophobia—or, “fear of the foreign”—seemed to take hold. The sentiment of these new nativists was that if more people came to the U.S., they should be like those already here. While the new policy mentioned only “national origins,” minority religious communities experienced the force of this constriction as aimed directly at them. Since the great waves of Jewish immigration from Eastern Europe and Catholic immigration from Eastern and Southern Europe did not reach full force until after 1890, the numbers of those allowed entry to the U.S. was sharply restricted. Sikhs from India and Buddhists from China and Japan also felt the blow directly, since the bill limited new immigration to those eligible for citizenship. At this point Asians were still being declared ineligible for naturalization as citizens under a 1790 statute limiting naturalization to “free white persons.” A Supreme Court decision of 1923 stripped a Sikh immigrant, Bhagat Singh Thind, of his naturalized citizenship when the court ruled he did not qualify as a “white” person. A similar decision had already determined that Japanese and other “orientals” did not qualify. Thus, with Asians ineligible for citizenship, the 1924 immigration act virtually stopped new immigration from Asia, including the wives and families of those already settled here. The rising xenophobia was fed by fears that the “mongrelization” of American culture would weaken America. Political and economic unrest was compounded with the touting of race-based theories of character and intellectual ability in which the Anglo-Saxons and Scandinavians of Northern Europe were deemed to be superior to the swarthy Italians, Spaniards, and Eastern European Jews. Ideas about “race” were inevitably bound up with equally ill-informed ideas about religion. The reorganization and public resurgence of the Ku Klux Klan, for instance, made public blatantly anti-Semitic and anti-Catholic statements on Main Streets everywhere. The population of Jews in America had expanded from a quarter million in 1880 to 4 million by 1925, a number large enough to be perceived as a threat. In Anti-Semitism in America, Leonard Dinnerstein chronicles the spread of anti-Jewish sentiment in these years. Some, he writes, blamed urban economic and social problems on the Jews. In Christian Sunday Schools, Jews were mentioned only in terms of their role in Christ’s death. Industrialist Henry Ford excluded Jews from Dearborn, the Detroit suburb he built to house his Ford Motor Company workers. Ford’s newspaper, The Dearborn Independent, regularly promulgated images of Jews that were in line with KKK propaganda and drew from The Protocols of the Elders of Zion, a book put out by the Russian secret police claiming that Jews were agents of the Devil seeking to overthrow Western civilization. As ambitious Jewish students began to be admitted to Harvard University in disproportionate numbers, even Harvard’s President A. Lawrence Lowell spoke of what he called a “Jewish problem” at Harvard, a problem only restrictive quotas could solve. Catholics endured different versions of the same fear. Italian Catholics were condemned not only for looking culturally “different” from the more established German and Irish Catholics who preceded them, but also for religious rituals, such as the outdoor festas, that Protestants were quick to call “baroque” at best and “pagan” at worst. Italian Catholics were also criticized for their commitment to the Pope in Rome, which was perceived as a threat to American national security and stability. In 1928, when the Democrats selected a Catholic, Al Smith, as their presidential nominee, the Ku Klux Klan drummed up severe opposition to him, bringing all the virulence and ignorance of the earlier Know-Nothing movement back to the surface of America’s public life. Cartoons depicted a meeting of Al Smith’s cabinet chaired by the Pope. Fortunately, xenophobia was not the only impulse of this period. Pioneering efforts were made to bring Protestant, Catholics, and Jews together to work for common social and civic goals, such as improving conditions for industrial workers and resettling immigrants. The initiative came primarily from the Protestant establishment. The Federal Council of Churches, for example, formed a Committee on Goodwill between Jews and Christians. Over the course of a decade, the goodwill movement came to involve prominent and energetic Catholics and Jews. The Central Conference of American Rabbis formed a Committee on Goodwill as well, and in 1929, the Catholic-led Calvert Round Table brought some 500 Catholics, Jews, and Protestants to Harvard to discuss prejudice and mutual stereotypes. The goodwill movement as it was called was not a unified movement, but a loose coalition of what would now be called “interfaith” initiatives. The National Council of Christians and Jews (now the National Conference for Community and Justice) for example, had its genesis in this period. In dozens of statements and action initiatives, Catholics, Protestants, and Jews stood firmly together against the “hooded bands” of KKK supporters and their anti-Jewish, anti-Catholic rhetoric. There were those within all three religious communities who were suspicious of the goodwill movement, but it did publicly articulate an America which Catholics, Protestants, and Jews could all share, and to which all could contribute. With the economic chaos of the Depression in the 1930s, the fault lines marked by restrictionist xenophobia and new, sometimes uneasy, interfaith alliances cracked and widened. For some, the economic crisis heightened resentment toward Jewish and Catholic immigrants perceived to be taking “American” jobs. President Roosevelt’s New Deal came under attack as the “Jew Deal” because of the unprecedented number of Jews hired by the Administration to implement its major reforms and the perception of Jewish control. With the dawn of World War II, America’s distrust of ethnic and religious “Others” peaked. When the Japanese bombed Pearl Harbor, the reactive campaign against Japanese Americans had a devastating impact on a community of immigrants, many now in the second and third generation. Forced into internment camps, they were now prisoners within their own country. The leadership of Japanese Buddhist communities was treated with special suspicion. Jodo Shinshu Buddhism emerged from the camps with a new, more American name: Buddhist Churches of America. While holding some of its own citizens in internment camps, the American government was slow to recognize and respond to the existence of concentration camps in Europe. Some had even warmed to Hitler’s anti-Semitic campaigns and felt sympathy with German assertions of Jewish responsibility for national economic hardship. In 1940, facing mixed public sentiment and a newly elected conservative House and Senate, Roosevelt hesitated to offer refugee assistance to European Jews fleeing certain death. The War Refugee Board was not established until 1944, only after Roosevelt’s Secretary of the Treasury presented him with irrefutable evidence of both the systematic destruction of the Jews and American indifference to it. Leaping ahead several decades, xenophobia is once again on the rise in the in the midst of a new period of immigration. Immigrants from the Philippines, Korea, India, Pakistan, Vietnam, Cambodia, Mexico, and Central America have brought new cultural and religious traditions to the United States, and the “immigration debate” is lively and heated. Have these new immigrants generated new economic prosperity in the crumbling cities of urban America, or have they taken jobs from native-born citizens, including African Americans? Has the diversity of new traditions created a brilliant multicultural tapestry, or is it simply too much for the fabric of American society to incorporate? Are the foreign-born the source of America’s problems or contributors to their solutions? The perspective of history reminds us that the debate is not a new one. It may astonish many Americans today to find that Asians were excluded from eligibility for U.S. citizenship for the first part of this century. The Ozawa decision (1922) and the Thind decision (1923) were Supreme Court decisions upholding the 1790 statute excluding all but “whites” from citizenship. The reasoning of the judges in the Thind case, given below, reveals many of the racial presuppositions of the day. 1) Aliens 61—“White person” in Naturalization Act must be given popular meaning. In Rev. St. § 2169 (Comp. St. § 4358), extending the provisions of the Naturalization Act to aliens who are free white persons, the term “white persons” is a popular and not a scientific term, and must be given its popular meaning, and as such is not to be construed as identical with “Caucasian,” unless the latter term is given its popular meaning, as referring to recognized racial distinctions existing at present, and not to possibly common ancestry of dissimilar races. caste Hindu is not a “white person,” within Naturalization Act. caste Hindu, even though some authorities class such Hindus as members of the Caucasian race, and this construction is fortified by the provision of Immigration Act Feb. 5, 1917, § 3 (Comp. St. 1918, Comp. St. Ann. Supp. 1919, § 49893 1/4 b), excluding all inhabitants of India. 3) Statutes 216—Debate can be considered in construction, though not basis therefore. Though the debates in Congress during the consideration of an act form no basis for its judicial construction, they cannot be altogether ignored in the search for the true meaning of words which are in themselves historic. On certificate from the United States Circuit Court of Appeals for the Ninth Circuit. caste Hindu was a white person, and whether the Immigration Act of 1917 disqualified him from naturalization. First question answered in the negative. Mr. Solicitor General Beck, of Washington, D. C., for the United States. Mr. Will R. King, of Washington, D. C. for Thind. caste Hindu, of full Indian blood, born at Amritsar, Punjab, India, a white person within the meaning of section 2169, Revised Statutes? 2) Does the Act of February 6, 1917 (39 Stat. 875, § 3), disqualify from naturalization as citizens those Hindus now barred by that act, who had lawfully entered the United States prior to the passage of said act? [1.] If the applicant is a white person, within the meaning of this section, he is entitled to naturalization; otherwise not. In Ozawa v. United States, 260 U. S. 178, 43 Sup. Ct. 65, 67 L. Ed., decided November 13, 1922, we had occasion to consider the application of these words to the case of a cultivated Japanese and were constrained to hold that he was not within their meaning. As there pointed out, the provision is not that any particular class of persons shall be excluded, but it is, in effect, that only white persons shall be included within the privilege of the statute. “The intention was to confer the privilege of citizenship upon that class of persons whom the fathers knew as white. And to deny it to all who could not be so classified. It is not enough to say that the framers did not have in mind the brown or yellow races of Asia. It is necessary to go farther and be able to say that had these particular races been suggested the language of the act would have been so varied as to include them within its privileges,” citing Dartmouth College v. Woodward, 4 Wheat. 518, 644, 4 L. Ed. 629. Following a long line of decisions of the lower Federal courts, we held that the words imported a racial and not an individual test and were meant to indicate only persons of what is popularly known as the Caucasian race. But, as there pointed out, the conclusion that the phrase “white persons” and the word “Caucasian” are synonymous does not end the matter. It enabled us to dispose of the problem as it was there presented, since the applicant for citizenship clearly fell outside the zone of debatable ground on the negative side; but the decision still left the question to be dealt with, in doubtful and different cases, by the “process of judicial inclusion and exclusion.” Mere ability on the part of an applicant for naturalization to establish a line of descent from a Caucasian ancestor will not ipso facto and necessarily conclude the inquiry. “Caucasian” is a conventional word of much flexibility, as a study of the literature dealing with racial questions will disclose, and while it and the words “white persons” are treated as synonymous for the purposes of that case, they are not of identical meaning—idem per idem. In the endeavor to ascertain the meaning of the statute we must not fail to keep in mind that it does not employ the word “Caucasian,” but the words “white persons,” and these are words of common speech and not of scientific origin. The word “Caucasian,” not only was not employed in the law, but was probably wholly unfamiliar to the original framers of the statute in 1790. When we employ it, we do so as an aid to the ascertainment of the legislative intent and not as an invariable substitute for the statutory words. Indeed, as used in the science of ethnology, the connotation of the word is by no means clear, and the use of it in its scientific sense as an equivalent for the words of the statute, other considerations aside, would simply mean the substitution of one perplexity for another. But in this country, during the last half century especially, the word by common usage has acquired a popular meaning, not clearly defined to be sure, but sufficiently so to enable us to say that its popular as distinguished from its scientific application is of appreciably narrower scope. It is in the popular sense of the word, therefore, that we employ it as an aid to the construction of the statute, for it would be obviously illogical to convert words of common speech used in a statute into words of scientific terminology when neither the latter nor the science for whose purposes they were coined was within the contemplation of the framers of the statute or of the people for whom it was framed. The words of the Statute are to be interpreted in accordance with the understanding, of the common man from whose vocabulary they were taken. See Maillard v. Lawrence, 16 How. 251, 261, 14 L. Ed. 926. They imply, as we have said, a racial test; but the term “race” is one which, for the practical purposes of the statute, must be applied to a group of living persons now possessing in common the requisite characteristics, not to groups of persons who are supposed to be or really are descended from some remote, common ancestor, but who, whether they both resemble him to a greater or less extent, have, at any rate, ceased altogether to resemble one another. It may be true that the blond Scandinavian and the brown Hindu have a common ancestor in the dim reaches of antiquity, but the average man knows perfectly well that there are unmistakable and profound differences between them today; and it is not impossible, if that common ancestor could be materialized in the flesh. We should discover that he was himself sufficiently differentiated from both of his descendants to preclude his racial classification with either. The question for determination is not, therefore, whether by the speculative processes of ethnological reasoning we may present a probability to the scientific mind that they have the same origin, but whether we can satisfy the common understanding that they are now the same or sufficiently the same to justify the interpreters of a statute—written in the words of common speech, for common understanding, by unscientific men—in classifying them together in the statutory category as white persons. In 1790 the Adamite theory of creation—which gave a common ancestor to all mankind—was generally accepted, and it is not at all probable that it was intended by the legislators of that day to submit the question of the application of the words “white persons” to the mere test of an indefinitely remote common ancestry, without regard to the extent of the subsequent divergence of the various branches from such common ancestry or from one another. caste Hindu stock, born in Punjab, one of the extreme northwestern districts of India, and classified by certain scientific authorities as of the Caucasian or Aryan race. The Aryan theory as a racial basis seems to be discredited by most, if not all, modern writers on the subject of ethnology. A review of their contentions would serve no useful purpose. It is enough to refer to the works of Deniker (Races of Man, 317), Keane (Man, Past and Present, 445, 446), and Huxley (Man’s Place in Nature, 278) and to the Dictionary of Races, Senate Document 662, 61st Congress, 3d Sess. 1910-1911 p. 17.
called Aryan language was not spoken by a variety of races living in proximity to one another. Our own history has witnessed the adoption of the English tongue by millions of Negroes, whose descendants can never be classified racially with the descendants of white persons, notwithstanding both may speak a common root language. The word “Caucasian” is in scarcely better repute. It is at best a conventional term, with an altogether fortuitous origin, which under scientific manipulation, has come to include far more than the unscientific mind suspects. According to Keane, for example (The World’s Peoples, 24, 28. 307, et seq. ), it includes not only the Hindu, but some of the Polynesians (that is, the Maori, Tahitians, Samoans, Hawaiians, and others), the Hamites of Africa, upon the ground of the Causcasic cast of their features, though in color they range from brown to black. We venture to think that the average well-informed white American would learn with some degree of astonishment that the race to which he belongs is made up of such heterogeneous elements. The various authorities are in irreconcilable disagreement as to what constitutes a proper racial division. For instance, Blumenbach has 5 races; Keane following Linnaeus. 4; Deniker, 29. The explanation probably is that “the innumerable varieties of mankind run into one another by insensible degrees,” and to arrange them in sharply hounded divisions is an undertaking of such uncertainty that common agreement is practically impossible. In the Punjab and Rajputana, while the invaders seem to have met with more success in the effort to preserve their racial purity, intermarriages did occur producing an intermingling of the two and destroying to a greater or less degree the purity of the “Aryan” blood. The rules of caste, while calculated to prevent this intermixture, seem not to have been entirely successful. eyed, swarthy people of Alpine and Mediterranean stock, and these were received as unquestionably akin to those already here and readily amalgamated with them. It was the descendants of these, and other immigrants of like origin, who constituted the white population of the country when section 2169, reenacting the naturalization test of 1790, was adopted and, there is no reason to doubt, with like intent and meaning. [3.] What, if any, people of primarily Asiatic stock come within the words of the section we do not deem it necessary now to decide. There is much in the origin and historic development of the statute to suggest that no Asiatic whatever was included. The debates in Congress, during the consideration of the subject in 1870 and 1875, are persuasively of this character. In 1873, for example, the words “free white persons” were unintentionally omitted from the compilation of the Revised Statutes. This omission was supplied in 1875 by the act to correct errors and supply omissions. 18 Stat. c. 80, p. 318. When this act was under consideration by Congress efforts were made to strike out the words quoted, and it was insisted upon the one hand and conceded upon the other, that the effect of their retention was to exclude Asiatics generally from citizenship. While what was said upon that occasion, to be sure, furnishes no basis for judicial construction of the statute, it is, nevertheless, an important historic incident, which may not be altogether ignored in the search for the true meaning of words which are themselves historic. That question, however, may well be left for final determination until the details have been more completely disclosed by the consideration of particular cases, as they from time to time arise. The words of the statute, it must be conceded, do not readily yield to exact interpretation, and it is probably better to leave them as they are than to risk undue extension or undue limitation of their meaning by any general paraphrase at this time. What we now hold is that the words “free white persons” are words of common speech, to be interpreted in accordance with the understanding of the common man, synonymous with the word “Caucasian” only as that word is popularly understood. As so understood and used, whatever may be the speculations of the ethnologist, it does not include the body of people to whom the appellee belongs. It is a matter of familiar observation and knowledge that the physical group characteristics of the Hindus render them readily distinguishable from the various groups of persons in this country commonly recognized as white. The children of English, French, German, Italian, Scandinavian, and other European parentage quickly merge into the mass of our population and lose the distinctive hallmarks of their European origin. On the other hand it cannot be doubted that the children born in this country of Hindu parents would retain indefinitely the clear evidence of their ancestry. It is very far from our thought to suggest the slightest question of racial superiority or inferiority. What we suggest is merely racial difference, and it is of such character and extent that the great body of our people instinctively recognize it and reject the thought of assimilation. It is not without significance in this connection that Congress, by the Act of February 5, 1917, 39 Stat. 874, c. 29, § 3 (Comp. St. I918, Comp. St. Ann. Supp. 1919, § 4289 1/4 b), has now excluded from admission into this country all natives of Asia within designated limits of latitude and longitude, including the whole of India. This not only constitutes conclusive evidence of the congressional attitude of opposition to Asiatic immigration generally, but is persuasive of a similar attitude toward Asiatic naturalization as well, since it is not likely that Congress would be willing to accept as citizens a class of persons whom it rejects as immigrants. 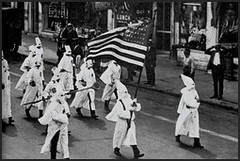 The Ku Klux Klan was responsible for the rise and expression of anti-Catholic and anti-Semitic prejudice in the period following World War I. The resurgence of the KKK was a matter of great public concern. The Federal Council of Churches made the first concerted and authoritative Protestant response in a statement on September 22, 1922. We, the order of the Knights of the Ku Klux Klan, reverentially acknowledge the majesty and supremacy of the Divine Being, and recognize the goodness and providence of the same. We recognize our relation to the Government of the United States of America, the supremacy of its Constitution, the Union of States thereunder, and the constitutional laws thereof, and we shall be ever devoted to the sublime principles of a pure Americanism and valiant in the defence of its ideals and institutions. We avow the distinction between the races of mankind as same has been decreed by the Creator, and we shall every be true to the faithful maintenance of White Supremacy and will strenuously oppose any compromise thereof in any and all things. We appreciate the intrinsic value of a real practical fraternal relationship among men of kindred thought, purpose, and ideals and the infinite benefits accruable therefrom, and we shall faithfully devote ourselves to the practice of an honorable clannishness that the life and living of each may be a constant blessing to others. ‘Non silba sed anthar’—Original creed revised. The following is a brief excerpt of an article written by an Indiana newspaper man, Lowell Mellett (1884-1960), who was alarmed by the growing public presence of the KKK in Indiana in the early 1920s. Mellett was a distinguished journalist and served as an administrative assistant to President Franklin D. Roosevelt from 1940-1944. So long ago that “On the Banks of the Wabash” had not yet been written, I was a boy in Indiana…Catholics were still something of a novelty to us natives. We had profound knowledge of the Protestant churches. We knew the Methodists, the Christians, the Baptists, the Presbyterians, the Campbellites, the Protestant Episcopals; knew which had the least irksome services; which Sunday School had the shortest sessions. But the Catholics happened to be newcomers. They came in on the boom that followed the discovery of natural gas and the building of many glass factories and steel and iron mills. They were strangers to us and consequently feared. It was some time before we realized that one of us was about as good, pound for pound, in a battle as one of the funny-talking lads from Pittsburgh. That having been established, in due course the barriers went down. The newcomers were absorbed into the community and it soon was as if they always had been there. …Today [worry about the Catholics] has been revived. It is part of the state of mind that accounts for the amazing growth of the Ku Klux Klan in the old Hoosier commonwealth; that enables Indiana to compete with Ohio for the distinction of having a larger Klan membership than any other state. It helped make possible the remarkable election results of last fall, when practically every candidate opposed by the Klan went down in defeat. In Indiana, as in other states, the Klan has the usual trilogy of fears. It fears the Jews, the Negroes, and the Catholics. But I heard little concerning the Jews and the Negroes. I heard much concerning the Catholics…Very clearly the crux of the Klan problem in Indiana is the Catholic Church. The Klan is feeding on a revival of anti-Catholic feeling and renewed circulation of Catholic goblin stories. Men actually join the Klan because they believe that a magnificent home (a million-dollar palace is the term usually used) is being built in Washington, D.C. to house the Pope, and that the Vatican is soon to be moved to America! Many have believed it is a fixed policy of the Church to keep its members down to a definite level of ignorance. Ku Klux Klan organs now assiduously spread this idea. The truth seems more nearly to be that the effort to spread education—general education, not merely sectarian education—is as great among Catholics as among Protestants. Indeed, one of the most serious charges against the Church that you hear in Indiana is that they are endeavoring to obtain control of the public schools. Why? To wreck the public school system, to be sure! The Catholics have had control of the School Board in Indianapolis for years, several excited informants told me, and they would say, look how the schools have deteriorated! Investigation revealed that the Catholics had been represented on the School Board by one member. The superintendent of schools in a certain city, I was told in a confidential whisper, is a Catholic. But I had know this man intimately for half a life time and knew the contrary to be true…However, unreasonable as are the allegations on which the Klan’s growth is largely based, this growth is the most important fact in Indiana today. The pages of Henry Ford’s company paper were known for attacks on Jews, as well as for the frequent claim that anti-Semitism did not exist in the United States and was, in fact, the creation of the Jewish leaders. The tone of the article speaks louder than its words. Mark this: All the anti-Semitism that exists in the United States today is the deliberate creation of the Jewish leaders and is a recent creation. The Jewish leaders want anti-Semitism here. Unable to create it among non-Jews, they are seeking the effects of it among the Jews by telling them that it exists. The Jewish leaders of the United States have done everything possible to keep The Dearborn Independent away from the Jews, to prevent their reading it and learning the fact that NO ATTACK IS BEING MADE ON THE JEWS AS JEWS. From the first, after wrestling for weeks to discover a way of meeting these articles without having to confess too much, these leaders threw up their hands and took refuge in the lie of anti-Semitism. What they ought to fear now is not the force of an anti-Semitic feeling among the non-Jews, but the force of a righteous indignation among American Jews when they discover the deceit and incompetence of their leaders. “Anti-Semitism” has always been the last resort of scoundrelly Jewish leaders when cornered by the truth, and they have been known deliberately to incite it among the Gentile rabble in order through it to maintain their hold on their own people. The Goodwill Movement took many forms, beginning in the 1920s. Responding to the xenophobia and the anti-Catholic, anti-Jewish tone of the Ku Klux Klan, Jews, Protestants, and Catholics came together in an early form of the interfaith movement. In 1924, the Federal Council of Churches formed its Committee on Goodwill Between Christians and Jews and the Central Conference of American Rabbis formed a similar committee. Meeting together, these two groups issued their first joint statement. This was to become the nucleus of the National Conference of Christians and Jews, which was born in this period and continues to have a prominent role in American interreligious relations today. 1) The purpose of our committees is to promote mutual understanding and goodwill in the place of suspicion and ill will in the entire range of our inter-religious and social relationships. 2) Because of our mutual respect for the integrity of each others’ religion and our desire that each faith shall enjoy the fullest opportunity for its development and enrichment, these committees have no proselytizing purpose. 3) We endorse the statement of the Federal Council of the Churches of Christ in America made by its Administrative Committee in its resolution of September 22, 1922, declaring that ‘the rise of organizations whose members are masked, oath bound and unknown, and whose activities have the effect of arousing religious prejudices and racial antipathies, is fraught with grave consequences to the church and to society at large.’ To this statement we add our conviction that such organizations violate the fundamental principles and ideals of our country and religion, and merit our condemnation. 4) We realize further that we best reveal our fellowship by practical cooperation in common tasks, and it is our endeavor to formulate a program by which to realize the high purpose and noble endeavors of mutual good-will and helpfulness. In the 75th year of the Japanese Jodo Shinshu Buddhist presence in America, the Buddhist Churches of America published an extensive history of these years (excerpted here), including the most difficult: the internment of “all persons of Japanese ancestry” in camps following the bombing of Pearl Harbor. In recalling this history, the particular consequences of this era for the Buddhist community is noted. While news flashes were constantly printed onto the screens of the movie theaters and continued interruptions made throughout the radio broadcasts announcing the bombing of Pearl Harbor, tension and insecurity were rising in the Japanese American public. It was not something they had expected, yet whether in a theater, restaurant or other public places, the eerie feeling of being eyed as an enemy Japanese was the paramount feeling on this particular day, December 7, 1941. The newsboys shouting out, “Extra! Extra! 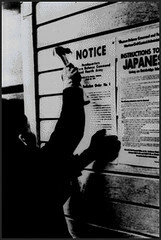 Pearl Harbor bombed by the Japs!” rang out throughout the main streets of American cities. What were once the gay and lively “Japanese Towns” of the Pacific Coast area soon turned into ghost towns, seemingly overnight. Store owners closed shop early for fear of reprisal. Doubt, suspicion and anger cast their shadows upon the Japanese community; moreover, without any warning, the leaders of these communities were incarcerated into jails, immigration stations, Federal prisons and military camps. The Japanese Buddhist leaders were not an exception. A large number of the ministers were removed from their temples and homes. And, with the ministers and the many Buddhist lay leaders incarcerated, leaving only the wives and young children stranded, massive chaos in the religious institutions was the order of the day. The membership was apprehensive about approaching their temple for fear of being apprehended. . . . Though some were released, most of them were herded into Internment Camps further inland. Without due process of law they were considered dangerous and detained under security measures for the duration of the war. Under limited facilities the Buddhist ministers and members did their best to hold services and study classes. An interesting story is related by an elder minister who was detained at Bismark, North Dakota. For the first Hanamatsuri [Buddha’s birthday] service, a figure of the standing baby Buddha was unavailable for the Hanamido. Arthur Yamabe, who was later to become a minister, carved a figure from a carrot which he obtained from the mess hall kitchen. War hysteria nurtures much misguided and misinformed news. Those who had little confidence in their own religious beliefs believed that any association with a Buddhist organization would be to their disadvantage. Possession of Japanese writings became suspect and a source of concern; thus, the fearful ones removed their Buddhist altar, destroyed their sutra books and burned their family albums containing photos of relatives or friends in uniform. Therefore, the Buddhist temples, the hardest hit organizations, tried to function in this time of absolute turmoil. While the Protestant churches and the Catholics could look to their white counterparts, the Buddhists had almost no outside support. . . .
…This was also the period when many members were thinking about changing the name “Buddhist Mission of North America” to the “Buddhist Churches of America.” The change was primarily to emphasize the word “America” and to indicate that the Jodo Shinshu organization should be representative of all the Buddhist groups. With U.S. war losses becoming marked, the alleged submarine attack along the Santa Barbara coastal regions and further hysteria raised by blackouts, greater restrictions upon the Japanese people were being contemplated. There are many stories of the evacuation… Certain areas already receiving rumors concerning an evacuation began to have the temple windows and doors boarded up. The shrine section of many were dismantled and the image of the Amida or the scroll was taken by the resident minister, his wife, or a responsible lay leader.